We’d love your help. Let us know what’s wrong with this preview of The Butterfly Conspiracy by Vivian Conroy. In late Victorian times, when new inventions cause both excitement and terror, a mysterious death at a zoological lecture brings together two unlikely allies in a quest through London's upper crust and underbelly to unravel the ingenious murder method and killer behind it. Miss Merula Merriweather is not like other women her age: instead of hunting for a husband at balls and soirees she spends her time in a conservatory hatching exotic creatures. As the Royal Zoological Society won't accept a woman's accomplishments, she has her uncle Rupert take credit for her achievements. But at a zoological lecture, the guest of honor dies after contact with one of Merula's butterflies, and Merula's uncle is arrested for murder. In an attempt to safeguard evidence to prove his innocence, Merula almost gets killed but for the timely interference of enigmatic Lord Raven Royston. Viewing natural history as a last resort to regain respectability lost by too many dubious business investments, Raven didn't expect his first lecture to take a murderous turn. Feeling partially responsible because he encouraged Merula to release the gigantic butterfly from the glass case in which it was kept, Raven suggests they solve the puzzle of Lady Sophia's sudden death together by looking closer at her relations with estranged friends, long suffering staff and the man groomed to be her heir, so close to her money and yet unable to touch any of it. To ask other readers questions about The Butterfly Conspiracy, please sign up. This is the first book I've read by this author. I don't read many mystery books but this one really captured my attention. My daughter also collects and studies butterflies and I saw many similarities between the work Miss Merula Merriweather, the main character and my daughter do. Merula is an unconventional young lady for her Victorian time period. She is not the usual female at balls simpering behind her fan,batting her eyelashes at gentlemen, no she does fascinating stuff, like raise butter This is the first book I've read by this author. I don't read many mystery books but this one really captured my attention. My daughter also collects and studies butterflies and I saw many similarities between the work Miss Merula Merriweather, the main character and my daughter do. Merula is an unconventional young lady for her Victorian time period. She is not the usual female at balls simpering behind her fan,batting her eyelashes at gentlemen, no she does fascinating stuff, like raise butterflies. The Royal Zoological Society will not accept that a female can be accomplished in this field so she has her uncle Rupert take credit for her work. When the guest of honor dies suddenly at a zoological lecture after one of Merula's butterflies lands on her arm, who is arrested but her uncle. Much action,adventure,suspense and excitement as Merula sets out to prove her uncle's innocence but at what cost to her own safety? With the police hot on their trail and around every corner will they be able to stay one step ahead of the law and still prove her uncle's innocence? There were a lot of characters introduced in the book but the author does it in a skillful way and seamlessly blends all the personalities into a smooth reading suspense. Enchanting start to a new series that I highly recommend. THE BUTTERFLY CONSPIRACY (A Merriweather and Royston Mystery #1) by Vivian Conroy is an entertaining historical cozy mystery that pulled me in from the start. I love mysteries set in Victorian times, with all the new discoveries and inventions and the societal conventions that are still in place, but on the verge of change. This is a great start to a new historical cozy mystery series that is both fast paced and easy to read. Miss Merula Merriweather would much rather be in her conservatory hatching exotic butterflies and studying all things zoological than worrying about the latest fashions and balls. Left as a toddler to be raised by her mother’s sister and husband, Merula has been encouraged in her interests by her uncle. Because of the times in which they live, her uncle Rupert must take credit for her discoveries and accomplishments. When she releases her latest hatchling at a meeting of the Zoological Society to prove it is real, it lands on Lady Sophia’s arm and she immediately falls over dead. Uncle Rupert, who everyone believes is the true butterfly expert, is immediately accused of her murder and arrested. Merula believes that her butterfly had nothing to do with Lady Sophia’s death, but how to prove it? Lord Raven Royston feels responsible for the arrest of Merula’s uncle and believes the authorities will come after her when they find out she is the true butterfly expert. It was because of his belief the butterfly was fake that Merula released it at the meeting. Lord Raven helps Merula to escape the police and they both start to try to piece together the real cause and reason for Lady Sophia’s death. I love Merula and Raven! The author has brought the main characters to life in description and dialogue. Each has a partial backstory revealed during the book that added depth and I am sure will lead to future adventures. Thoughout the book their friendship grows and I hope it will turn into more in future books. The secondary characters of Galileo, Bowsprit and Lamb add to the realism of this time period and its class system. This is a great cast of characters that I am looking forward to following into future mysteries. The plot was full of red herrings and I felt the execution of the murder was ingenious. I cannot wait for the next book in this series! Thank you so much to Crooked Lane Books and Net Galley for allowing me to read this eARC in exchange for an honest review. Vivian Conroy It is set primarily in London in the late Victorian time period. The Butterfly Conspiracy: A Merriweather and Royston Mystery is the first book in her ‘Merriweather and Royston’ series. In it we find Merula Merriweather trying to follow her odd (for the time) passion for science, specifically for zoological science focusing on butterflies. In order to be accepted in Victorian society, her Uncle Rupert needs to be the front person of the venture, and the person for whom all discoveries will be credited. The first of Merula’s huge ‘Attacus Atlas’ butterflies has emerged from its cocoon on the day of the Royal Zoological Society’s meeting at Lord Havilock’s. Merula decides to take the butterfly, and her Uncle Rupert attends the meeting to introduce ‘his’ new discovery to the group. But things pretty much go wrong from the beginning. Lord Raven Royston taunts that the huge butterfly under the glass done cannot possibly be real. It must be made up of paper with hidden strings to make it move. Thus prompted to show that the butterfly is in fact real, Merula lifts the glass dome and allows the butterfly to fly away. Unfortunately for all concerned, especially the butterfly, it lands on Lady Sophia’s bare arm. After sitting there for a few seconds, Lady Sophia collapses and is soon pronounced dead. The consensus in the room is that Uncle Rupert’s butterfly stung or poisoned Lady Sophia somehow, causing her death. During the hub-bub surrounding the aftermath of the death, Royston pulls Miss Merriweather out of the house and away from the fracas. He feels badly that his taunting caused her to release the butterfly. He vows to help her avoid capture by the police, and to clear her Uncle’s name. Thereafter, Merula and Raven traipse across London, staying at an eccentric scientist’s home, and other locations throughout London and in the countryside. With the aid of Royston’s valet, Bowsprit; they start gathering clues and sorting out suspects while continuing to avoid the Bobbie’s in London and in the countryside surrounding London. The suspect list grows and shrinks, while clues are developed and discarded. Along the way, we learn more about the background of these two seemingly ill-fated detectives as the story progresses. Eventually the mystery is solved, and all is right with the world again. I was surprised by who the culprit was, and entertained by the description of science and scientific beliefs during that time. I was not convinced that the murder weapon would actually have worked the way it was described. I also doubt that the social mores of the time would have allowed Merula to stay overnight in a house with Royston; his scientist friend, Gallileo; and the manservant Bowsprit; without having another female in the house. She didn’t seem to have any qualms about ruining her reputation by that action. That seemed like an odd misstep for a Victorian era timeframe. All in all I think it was a good first effort for this series. I’ll give the next book in the series a go when it is published. Can a single butterfly be the culprit for a death or is the murderer using it for a cover? Merula has been secretly hatching and raising exotic butterflies. She can’t take the credit but is satisfied with allowing her uncle to receive all the praise. Her latest butterfly has just hatched and she’s beyond excited to show it off at the Royal Zoological Society lecture. But after meeting Lord Raven Royston and having him question whether her butterfly is real, Merula releases the butterfly. Gasps of Can a single butterfly be the culprit for a death or is the murderer using it for a cover? Merula has been secretly hatching and raising exotic butterflies. She can’t take the credit but is satisfied with allowing her uncle to receive all the praise. Her latest butterfly has just hatched and she’s beyond excited to show it off at the Royal Zoological Society lecture. But after meeting Lord Raven Royston and having him question whether her butterfly is real, Merula releases the butterfly. Gasps of amazement soon turn to shouts of murder when Lady Sophia collapses and soon after dies after the poor butterfly lands on her arm. The society accuse Merula’s uncle and he’s arrested for murder. Being a witness, she’s wanted by the police so she goes into hiding, thanks to Lord Raven. As the two work together and investigate the murder of Lady Sophia, a friendship develops. Can Raven and Merula bring the real murderer to justice or has Merula signed her own death certificate by unraveling The Butterfly Conspiracy. I love a good mystery and you add a strong, intelligent heroine with a dashing Lord in the backdrop of Victoria England, I’m in my happy zone. The plot is well-developed with hints to the mystery dropped in amongst witty dialogue and a cast of intriguing characters. Merula is a fascinating main character with her penchant to go head-first into danger without thinking of her own safety. Lord Raven has a very Heathcliff vibe with a dark past and immense pain hovering below the surface. The two of them work brilliantly together and I look forward to more adventures. An incredible Victorian Mystery and one I highly recommend! Disclaimer: I received an ARC from Crooked Lane Books via Netgalley in the hopes I’d review it. The summary of this book sounds interesting, but the writing did not live up to it. The characters were boring and the suspense is lacking. I didn't care who the murderer was by the end of the book. This is the first book in a new series by this talented mystery writing author. Set in late Victorian times, Miss Merula Merriweather is something of a blue stocking, much preferring to spend time investigating exotic insects to hunting for a husband. Although her gender would normally prevent her sharing her achievements, her uncle Robert encourages and supports her, even taking her to meetings of the Royal Zoological Society. However, at one such meeting, one of the butterflies which Merula ha This is the first book in a new series by this talented mystery writing author. Set in late Victorian times, Miss Merula Merriweather is something of a blue stocking, much preferring to spend time investigating exotic insects to hunting for a husband. Although her gender would normally prevent her sharing her achievements, her uncle Robert encourages and supports her, even taking her to meetings of the Royal Zoological Society. However, at one such meeting, one of the butterflies which Merula has raised lands on Lady Sophia, the guest of honour, who immediately dies. Her uncle is arrested, accused of murdering the victim and so begins Merula’s determined efforts to prove his innocence – with the help of Lord Raven Royston. As the two try to evade the police’s attempts to find them both, they’ll face deadly danger in their attempts to discover the murderer and clear her Uncle of the charges. This is a delightful start to a new cosy Victorian mystery series and I really can’t wait to read more adventures involving the brilliant Merula and Raven! Both characters have some of their backstory revealed in this story, with hints and clues I presume relating to aspects to be further explored in future stories in the series. I enjoyed how their relationship develops and I really hope it will continue to do so as the series progresses. The story is well paced, has laugh out loud moments and is a real page turner that had me enthralled from the start. There are some superb secondary characters, too, especially Galileo and Bowspirit as well as Lamb who assist the duo in their investigations. There are plenty of twists and turns as well as dead ends necessitating reevaluating the evidence and discarding the red herrings discovered along the way. The plot is intriguing, misleading and highly entertaining and I can’t wait to read more stories starring this duo in future! A captivating historical cozy mystery, The Butterfly Conspiracy is an excellent debut to a new series! Suspenseful and thrilling, I was immediately sucked into the Victorian world superbly created, with intriguing characters and a puzzling plot that kept me turning pages. I liked the dynamic between Royston and Merula. She's wasn't a passive Victorian flower, he wasn't a man strong-arming her into being a passive Victorian flower. 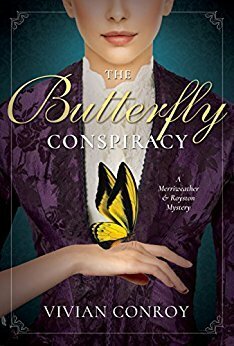 Although the possibility for a romance was hinted at, it wasn't o A captivating historical cozy mystery, The Butterfly Conspiracy is an excellent debut to a new series! Suspenseful and thrilling, I was immediately sucked into the Victorian world superbly created, with intriguing characters and a puzzling plot that kept me turning pages. I liked the dynamic between Royston and Merula. She's wasn't a passive Victorian flower, he wasn't a man strong-arming her into being a passive Victorian flower. Although the possibility for a romance was hinted at, it wasn't overt and took a backseat to the plot. I appreciated that, just like in food, the best flavors are in the background as an enhancement. It also leaves the door open to future story lines, and I look forward to seeing how their relationship develops. The plot was intriguing; at a zoological meeting, Merula unveils the exotic butterfly she has cultivated. Because she is a woman, Merula's Uncle Rupert agrees to take the credit, but when a woman dies after the butterfly lands on Lady Sophia's arm and she falls over, dead, Uncle Rupert is accused of murder. Determined to clear his name, Merula teams up with Lord Royston, uncovering many motives and suspects while pursued by the police. I have no idea if the method of death is feasible or not, but it wasn't something I've ever seen before and really enjoyed it, as well as the surprising and exciting ending. What Butterfly Conspiracy results in a woman’s death after a rare butterfly lands on her arm? Merula is left by her mother at her family’s house as a baby five years after her mother’s escape from the rigid Victorian house’s rules. Luckily, Merula’s fascination with butterflies is supported by her Uncle Rupert. In those sexist times, Merula’s rare butterfly, Attacus Atlas, must be displayed at a house party by the Royal Zoological Society as her Uncle’s work. When rich Lady Sophia drops dead afte What Butterfly Conspiracy results in a woman’s death after a rare butterfly lands on her arm? In those sexist times, Merula’s rare butterfly, Attacus Atlas, must be displayed at a house party by the Royal Zoological Society as her Uncle’s work. When rich Lady Sophia drops dead after handling the rare butterfly, Uncle Rupert is arrested for murder. Merula is helped to escape the house party by Lord Raven Royston known for the public failure of his investments. The two search for the real how and why of Lady Sophia’s death while trying to stay one step before the police. The characters they meet are a treat. Set in the same world as the Veronica Speedwell series, I enjoyed the self-effacing Merula’s world much better. The Butterfly Conspiracy is completely G rated which is more appropriate for the setting. Plus the mystery and the subtle romantic feeling between Merula and Royston seem more organic. I loved the twists leading up to the conclusion. I can’t wait for the next book in the Merriweather and Royston series. This book is recommended for Veronica Speedwell fans as well as historical fiction fans that enjoy a good mystery or vice versa. 4 stars! I think I'm one of the few people who did not enjoy this book. Like maybe one of five or something. First the Characters. Raven Royston and Merula Merriweather. Merula was an alright character. But she didn't really draw me into the story. It was interesting she was into zoology and the like but honestly she was a character that I didn't find myself caring what happened to her. Sure I wanted her to succeed and I think there were times when she was supposed to come across as strong and independent. (the one incident I can recall to mind is more of she lashed out because she was embarrassed more than asserting her independence.) She could have been a strong interesting character but she came across as rather two dimension. But At least she had a bit of a personality. Royston on the other hand not so much. He was, I'm pretty sure suppose to be the dashing hero with a bit of a bad boy side due to his reputation as a troublemaker. He was interchangeable with the two sidekicks, his manservant and his friend who actually was the more interesting of the three with his scientific experiments. Overall Conclusion it was an okay story. Very easy to put the book down and not pick it up again. But once I did; I wanted to finish. (because if I put it down again I wasn't going to pick it back up.) It didn't inspire a lot of emotion in me. No anxiety on behalf of the characters, no squeals, sighs or swoons over Raven's and Murela's interactions, no big ah-ha moments and only a vague sense of satisfaction, when the bad guy is arrested. Still I skimmed through the reviews and saw a lot of four and five stars. So my experience looked to be the outlier. Recommended? Eh I'd say go over the reviews first. am a huge fan of Ms Conroy’s Cosy Mysteries for a while now, they are stylish, intriguing and fun to read and when I heard about this new Victorian set series I couldn’t wait to get my sticky fingers on it. I have been avidly awaiting this book for ages and this is just so good, with a feel of Sherlock Holmes this is a fantastic start to what I know is going to be an intriguing and fabulous series. Set during the dark and somewhat forward-thinking Victorian era – I do love this era! After reading am a huge fan of Ms Conroy’s Cosy Mysteries for a while now, they are stylish, intriguing and fun to read and when I heard about this new Victorian set series I couldn’t wait to get my sticky fingers on it. I have been avidly awaiting this book for ages and this is just so good, with a feel of Sherlock Holmes this is a fantastic start to what I know is going to be an intriguing and fabulous series. So good and highly recommended! The Butterfly Conspiracy is compared to Deanna Raybourn's Veronica Speedwell series which I love, so of course I wanted to read it. Deanna Raybourn is one of my favorite mystery writers and one of the main reasons I love her books is because they are true to the eras she writes about. Deanna knowledge of Victorian era is extensive and her books are historically accurate. I cannot say the same about The Butterfly Conspiracy. When I read historical fiction or historical mystery I want it to be tru The Butterfly Conspiracy is compared to Deanna Raybourn's Veronica Speedwell series which I love, so of course I wanted to read it. Deanna Raybourn is one of my favorite mystery writers and one of the main reasons I love her books is because they are true to the eras she writes about. Deanna knowledge of Victorian era is extensive and her books are historically accurate. I cannot say the same about The Butterfly Conspiracy. When I read historical fiction or historical mystery I want it to be true to the time period, it's one of my biggest pet peeves when it's not. Even though I somewhat enjoyed the murder mystery part of the book, I was annoyed at how uncharacteristically for Victorian era the characters behaved. A single, young, gently bred woman, even if she is untitled, would not be spending nights in the house with two bachelors and a valet unchaperoned. She would not be traipsing around London alone with these three men or travel with them to the country without her family batting an eye. This would be a big scandal and she would be ruined. I also found it strange that Royston started to call Merula by her given name the next day he met her. That's another thing that would not be done unless they were married or related. I couldn't get past these (and other) historical inconsistencies and ended up not loving the book. I don't think it's in the same league as Veronica Speedwell series, at least not for me. Miss Merula Merriweather unlike other Victorian ladies has developed an interested in strange creatures. Thankfully her uncle and his family with which she lives protect her interest. Unfortunately at a zoological lecture, the guest of honour, Lady Sophia, dies and her uncle is arrested. Merula and very new friend Lord Royston seem determined to find the real culprit. An enjoyable and good start to this new series, though I didn't always like Merula. An easy to read story which introduces the new Miss Merula Merriweather unlike other Victorian ladies has developed an interested in strange creatures. Thankfully her uncle and his family with which she lives protect her interest. Unfortunately at a zoological lecture, the guest of honour, Lady Sophia, dies and her uncle is arrested. Merula and very new friend Lord Royston seem determined to find the real culprit. An enjoyable and good start to this new series, though I didn't always like Merula. An easy to read story which introduces the new characters well. There now seems to be an established team ready for the next mystery. Do you remember watching or reading Miss Marple or Sherlock Holmes, well if you did, then you are going to love this book. This is the first time that I have read this author and it won't be the last. This will be a short review, because otherwise their will be a lot of spoilers and especially this being a murder mystery. I loved reading this book and I really hope that there is more. I will give 5/5 stars, if I could give more I would. I received this book from Netgalley in return for a honest rev Do you remember watching or reading Miss Marple or Sherlock Holmes, well if you did, then you are going to love this book. This is the first time that I have read this author and it won't be the last. Absolutely brilliant book, and no the butler didn't do it ☺. I had a theory that I'd enjoy this book based on the ones I've recently read by Ms Conroy, and can say absolutely she blew me away. This book has everything, mystery, adventure, a wicked foe, I defy you to figure out who did it before the characters do, I certainly guessed wrong, our hero and heroine are truly awesome and I truly can't wait to read the next. Thank you for writing it dear lady. I wanted to love this one but there were a few things that just didn’t work for me. I did love the setting, the pace (it was a quick read) and I thought the end was well done. I didn’t really love the characters or the writing style though. I do think that most fans of historical cozy mysteries will like this one though and should give it a try! Checked this out from the library because the setting and characters sounded interesting. Finished it because it was short, and I nearly always finish a mystery once I start. But you could drive a truck through the holes in the plot. Meh. I finished this book a couple of days ago and already can't remember the names of the characters. I didn't get the sense that the author did much historical research for background, the characters clearly weren't memorable, and while I didn't hate it, I certainly didn't enjoy it particularly either. It feels like a knockoff version of Deanna Raybourn's Veronica Speedwell series, which I adore. Call me biased if you want, but I'd read that series instead. While I’m not usually one for cozy mysteries, the synopsis of this just sounded too good to not give a try–natural history, mysteries, and platonic crime fighting buddies all in the Victorian era just checked too many boxes to not request. It took me a few chapters to really get into the story and the characters, but once I did, I enjoyed the ride. Merula and Raven worked well together as society oddballs investigating the mysterious death of Lady Sophia after she attended a Zoological Society meeting. Merula’s rare hand-reared butterfly is assumed to have caused Sophia’s death, and Merula’s uncle is essentially framed for the murder by the butterfly. Meula takes it upon herself to investigate the crime and prove that it wasn’t her uncle behind the mysterious death. Some of the red herring plots seemed overly strung out, even if they were just there for one chapter, but they weren’t too annoying. The constant recapping of the case thus far was annoying, but seeing as there was no continuous base camp for Merula and friends to set up an official investigation board, verbally reviewing the case made sense. The speculative revelation of how Lady Sophia died was one that was fairly obvious to any modern reader and really didn’t seem like a reveal at all. But the reveal of the whodunit was a surprise and was well built up to, without too many crumbs leading in the perpetrators direction, but enough scenes to establish them as a possible suspect nonetheless. It wouldn’t surprise me in the least if, as the series continues, Merula and Raven’s relationship becomes romantic, rather than platonic, but I may still give another installment a try if I’m ever in the mood for a cozy mystery again! It was an engaging start to a new series, and the set up for the next storyline has be intrigued. Thank you to NetGalley for providing me with a free copy to review! Every now and then I need to pick up a book that doesn't have an ounce of romance in it, and so when I saw the gorgeous cover (yes, I'm one of *those* people) and read the synopsis, I knew this was a book I had to read. The funny thing is that you can infer romance if you want to, since the two main characters are a man and a woman around the same age who just so happen to be single. And there is a bit of chemistry. But honestly, what you're reading this book for are the colorful descriptions, i Every now and then I need to pick up a book that doesn't have an ounce of romance in it, and so when I saw the gorgeous cover (yes, I'm one of *those* people) and read the synopsis, I knew this was a book I had to read. The funny thing is that you can infer romance if you want to, since the two main characters are a man and a woman around the same age who just so happen to be single. And there is a bit of chemistry. But honestly, what you're reading this book for are the colorful descriptions, intriguing characters, and the deadly mystery that has you constantly changing your mind about who done it! I'm so glad to see that this is the first in a series, because I definitely want to read more Merriweather and Royston mysteries. Merula Merriweather wants very little to do with high society, unless it involves showcasing her zoological discoveries to the men who dominate the field. Since she is a woman, all credit goes to her uncle, however, and that's where the trouble begins. While displaying her newly discovered butterfly to a room of scholars and ladies, it becomes an instrument of murder, and since her uncle is believed to have discovered it, he is also the one believed to be the murderer. Knowing neither she nor her uncle killed anyone, she flees the scene, dragged away by Lord Raven Royston, a bystander who means to keep her safe. Having lost his mother at a young age to a situation beyond his control, he's determined that this time he will save a young woman in distress. Off on an adventure to discover the real murderer, Merula and Raven discover that many people have something to hide and secrets have a way of getting out if you know where to look. Merula was wonderfully refreshing for that time period! While she knew how society worked and acknowledged her part in it, she also refused to stop doing work that she loved. And her family was so supportive, which was really nice. Orphaned at a young age and taken in by her uncle and his family, she has found a haven with them, and in a world where female intelligence is seen as an oddity, she needed that. Raven was a puzzle - a dark, brooding, I-hope-there-is-a-romance-soon hero who just wanted to keep Merula safe, even at his own expense. His background was told with so much emotion and detail, that the reader feels like they are experiencing it with him. You can't help feel how close the two become once their pasts are revealed. Raven wasn't intimidated by Merula one bit and she wasn't scared of him either, so their pairing as friends and detectives meshed well. I can't wait to read the next book in the series! It's sure to be an exciting mystery full of adventure. And hopefully, a teensy bit of romance? Merula Merriweather finds herself deep in a murder investigation when an evening at a Royal Zoological Society meeting includes a dead body. Worst of all, Lady Sophia dies after a butterfly Merula has hatched lands on her arm. The first diagnosis is that the butterfly poisoned her somehow. Merula's Uncle Rupert is arrested for the crime since, of course, the butterfly research had to have been his since women don't do that kind of thing. Also, he had recently had a loud argument with Lady Sophia Merula Merriweather finds herself deep in a murder investigation when an evening at a Royal Zoological Society meeting includes a dead body. Worst of all, Lady Sophia dies after a butterfly Merula has hatched lands on her arm. The first diagnosis is that the butterfly poisoned her somehow. Merula's Uncle Rupert is arrested for the crime since, of course, the butterfly research had to have been his since women don't do that kind of thing. Also, he had recently had a loud argument with Lady Sophia whose nephew had been courting his daughter Julia. Merula and a new acquaintance - Lord Raven Royston - manage to escape before Merula's connection to the butterfly can be exposed. The two of them have to find out who killed Lady Sophia while keeping out of the hands of the police. Luckily, Raven has a useful and eclectic variety of friends who will be assisting them with their detecting. Galileo is a science nerd who volunteers to test a second butterfly to assure that the butterflies are harmless and couldn't have killed Lady Sophia. Bowsprit is Raven't valet and a very good detective himself with a wide variety of contacts. Among the suspects are Mr. Simon Foxwell, Julia's suitor and Lady Sophia's sole heir and Lord Havilock, the evenings host who wants some of his specimens back from Lady Sophia. Their investigation adds more suspects including Miss Knight who was Lady Sophia's companion but was in danger of being let go because Foxwell seemed to be trying to isolate Lady Sophia and make her dependent on him. Also, a young woman who is now a milliner but whose mother was formerly Lady Sophia's cook until being let go for accidentally adding an almond to a recipe which almost caused Lady Sophia to choke. I am not generally a fan of cozy mysteries, which I discovered this was part way into the first chapter. However, I genuinely enjoyed this read, and I would not hesitate to pick up another Merriweather and Royston mystery. The Butterfly Conspiracy centers around Merula Merriweather and Raven Royston, the alliteration is a bit much, but the characters are so charming that I let go of my irritation very quickly. Merula is charming and slightly naive without being a Mary-Sue character that is compl I am not generally a fan of cozy mysteries, which I discovered this was part way into the first chapter. However, I genuinely enjoyed this read, and I would not hesitate to pick up another Merriweather and Royston mystery. The Butterfly Conspiracy centers around Merula Merriweather and Raven Royston, the alliteration is a bit much, but the characters are so charming that I let go of my irritation very quickly. Merula is charming and slightly naive without being a Mary-Sue character that is completely perfect in every way. Royston is a more complex character with a good sense of humour and just enough black wit to keep me happy. I also just wanted to note that I started playing Hogwarts Mystery at the same time as I started this book, and I've been inundated with "Merula" characters! Merula is an avid entomologist, or zoologist, whatever you prefer. The whole murder is set off when one of her butterflies is accused of murdering Lady Sophia. The story is a typical murder mystery, and frankly it did keep me guessing the whole way through. I had the wrong character pegged as the murderer through most of the book. I didn't find any parts of it too implausible, and I really genuinely cared what happened next. The period writing was mostly acceptable, but I am a stickler for correct period writing, and I don't think that Merula staying with Royston without a female companion would have been acceptable, but I'm going to go out on a limb and suspend my disbelief. Again, this is because this story was just charming enough to allow me to let go. As I said earlier, this book was genuinely enjoyable, a very quickly paced read, and I could absolutely keep turning pages. It did lag a bit while the team was at Royston Manor, I found that a bit unnecessary, but I kept going. I can see a lot of good future potential for this duo of amateur detectives, and I must say that I really would pick up their next adventure. The novel is well written and Conroy’s voice is crisp, light, and contains the right amount of elegance to befit the Victorian Era. Merula is a resourceful woman who is equal with her male counterpart while still fitting within the norms of her world. I was relieved that she did not end up in a relationship with Lord Raven Roynston as they would have ruined their relationship and chemistry. Conroy plants enough red herrings to keep the reader’s attention and the ending follows a logic that is satisfying. While the book doesn’t take a lot of time to establish the world and characters, they still feel fully formed and offer the opportunity for a number of other adventures should Conroy want to continue the series. The pacing is fast, but well handled until the middle of the book. Lord Raven’s backstory is delved into and I believe that slows the book down. It seems that Conroy needed something to happen to fill the downtime between events and thought connecting Lord Raven’s past with the current mystery would be entertaining and insightful. While Raven is one of the most intriguing characters, the inclusion of his past seemed a little out of place and added an extra plotline that may have been best served in another book. I do enjoy a good historical mystery, and this one makes for excellent reading, true to the Victorian times it's set in. Murela Merriweather is not your usual airhead Victorian miss with a head full of fripperies; rather she uses her brain, and at a time when society refused to acknowledge that a woman could possibly even think for herself. A foundling, her uncle assists in aiding her to follow her activities and happily provides cover for her. As they set out for the Royal Zoological Society eve I do enjoy a good historical mystery, and this one makes for excellent reading, true to the Victorian times it's set in. Murela Merriweather is not your usual airhead Victorian miss with a head full of fripperies; rather she uses her brain, and at a time when society refused to acknowledge that a woman could possibly even think for herself. A foundling, her uncle assists in aiding her to follow her activities and happily provides cover for her. As they set out for the Royal Zoological Society evening, her uncle is regarded as the brains behind her discoveries. However, tragedy occurs, her uncle is arrested and Merula must flee from the authorities in the hope that she can get to the bottom of things and clear his name. I've thoroughly enjoyed Vivian Conroy's Lady Alkemene mystery series and I really hope this is the beginning of another long and fruitful series. This author has been extremely circumspect in maintaining the time period this novel is set in, and for a reader like me who tends to pick up on these small details, it's like nirvana! At the beginning, this seems like an unsolvable case but the intrepid duo of Merriweather and Royston - an unlikely pairing, perhaps - are not going to give up easily. With dogged determination they unravel the rare clues and keep picking away at the puzzle. With a fully understandable outcome, this is a cracking mystery and one I really got my teeth into. Adroitly planned and skilfully crafted, this is a marvellous enigma and bodes well for an exciting new series. Definitely one I want to follow, and have no hesitation in recommending to lovers of great mysteries. I am a big fan of Vivian Conroy's writing and the Butterfly Conspiracy certainly didn't disappoint. Here, yet again, we are introduced to a strong female character, Merula Merriweather, who is decades ahead of her time. Merula's passion is for butterflies. She spends her time, hidden away secretly researching and hatching the species. Due to negative opinions about women gaining success in the Victorian era, Merula's achievements are put down to the expertise of her Uncle Rupert. At a zoological e I am a big fan of Vivian Conroy's writing and the Butterfly Conspiracy certainly didn't disappoint. Here, yet again, we are introduced to a strong female character, Merula Merriweather, who is decades ahead of her time. At a zoological event, a lady dies soon after one of Merula's rare and exotic butterflies lands on her arm. It is immediately assumed that the butterfly poisoned Lady Sophia and therefore Merula's uncle is suspected of murder. Merula teams up with Lord Raven Royston to clear her uncle's name and a charismatic sleuthing duo is formed. Together the pair meticulously hunt through a web of secrets and lies to uncover the actual culprit. Royston has a strong protective side towards Merula, she is wanted by the police as a murder witness and he is determined to uncover the truth. I liked the slightest hint of romance between the two and wonder if a relationship will materialise in later books in this series. I had read other books by Vivian Conroy and enjoyed them so, when I saw she had a new series and that the setting was the Victorian era, well, I had to request it. May this series run a long, long time. Merula Merriiweather is the black sheep of her family, living with her Aunt, Uncle and cousin after being left with them as a baby. Not one to go husband hunting as most young women of her social station as doing, she is focused on raising butterflies. One slight problem, the Royal Zoological Soc I had read other books by Vivian Conroy and enjoyed them so, when I saw she had a new series and that the setting was the Victorian era, well, I had to request it. May this series run a long, long time. Merula Merriiweather is the black sheep of her family, living with her Aunt, Uncle and cousin after being left with them as a baby. Not one to go husband hunting as most young women of her social station as doing, she is focused on raising butterflies. One slight problem, the Royal Zoological Society won't acknowledge any woman's research so she has her uncle act as a front for her work. One of her large butterflies has hatched and she takes it to be presented at the society. The butterfly is released from its cage and lands on the arm of Lady Sophia just before she dies. Merula's uncle is accused of her death and the police want to arrest Merula as a witness to the crime,. Then the mystery really gets rolling along. She goes on the run with Lord Raven Royston, his valet and a scientist friend. This is my favorite kind of historical mystery and the characters were pitch perfect for the era. The mystery was very well crafted, full of twists, turns and red herrings. I will not hesitate to read every future entry in this series with great pleasure. Thank you Netgalley and Crooked Lane Books for the ARC. I had a really good time with this one. It's an easy read full of mystery and adventure playing out in late Victorian times. It was fun to learn how new inventions came along and medical conditions were discovered. The visit to a vegetarian restaurant put a smile on my face. The Butterfly Conspiracy deals with the Zoological Society which is another interesting field. When a death occurs, a team of scientists set out to find the cause. With m Thank you Netgalley and Crooked Lane Books for the ARC. When a death occurs, a team of scientists set out to find the cause. With modern day knowledge I got it about halfway through, but the story was captivating enough to keep me turning pages faster and faster, it's that well written. There's also a good twist in the conclusion. I have read other series by Vivian Conroy, and enjoyed them but I do feel this is something a bit special.. The mystery is so well revealed and cleverly plotted and the characters are wonderfully rich and have a great depth to them. The story is fast paced but manages to beautifully describe the characters, clothing, buildings and background without seeming to stop the flow of the high drama. The historical setting adds a great feature to the story and creates such fun situations for the main fem I have read other series by Vivian Conroy, and enjoyed them but I do feel this is something a bit special.. The mystery is so well revealed and cleverly plotted and the characters are wonderfully rich and have a great depth to them. The story is fast paced but manages to beautifully describe the characters, clothing, buildings and background without seeming to stop the flow of the high drama.